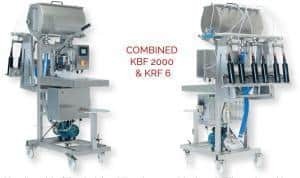 With the Kreuzmayr bag-in-box fillers and bottling lines, fruit juices can be filled into different vessels, thus making it possible to fill liquids (cold or hot from pasteurizer) into bottles or BAG-in-BOX pouches. The flow meter electronically reads the juice volume and the filling amount can be set on a digital display. (KBF) The bag-in-box filler stops automatically when the set volume is reached, ensuring a clean operation without any overflow of liquids. KBF: Ideally, the buffer tank is filled by the Kreuzmayr pasteurizer, and controlled via a filling level indicator. The desired filling volume is set at the digital display, and the juice is pumped into the bag via a pump which is monitored by a flow meter. The BAG-in-BOX pouch is then placed into the intake, the cap of the pouch is removed with the gripper and the filling valve is placed into the spout of the BAG. The filling process starts as soon as the spout is sealed, and finishes automatically when the set volume is reached. KRF: The Kreuzmayr line bottlers can fill bottles with different heights. This is done using a filling valve made of stainless steel, with a rubber gasket. The empty bottles are placed under the filler spout. This opens the filling valves and the liquid flows from the buffer tank into the bottles through gravity.